There comes a time in every music blogger's life when an album comes across that is difficult to review. It is not necessarily that the words don't seem to flow like you want them to or even that the music is so diverse that it is difficult to describe sometimes. Sometimes you really want to review an album and you really want to write a favorable review, but there is something blocking you from it. 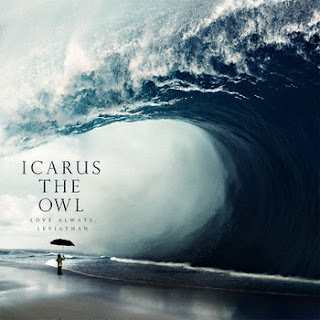 Icarus the Owl is a young band from Portland, Oregon and has crafted an interesting, yet flawed album in "Love Always, Leviathan." Musically, this disc toes the line between modern math rock and standard pop-punk. Neither of these genres truly interest me because there are too many bands in these scenes that are mediocre at best. Even the heavyweights such as newer Green Day are producing content heavy in radio-friendly vibes but sorely lacking in style. Some bands add little to the genre, others add virtually nothing. That said, I did find this album to be interesting enough to listen all the way through. The cover art is what really reeled me in, but like a riptide between two gnarly waves, I found myself drawn away from what the real intent of the music seems to be. Most of the tracks on this disc are standard-fare love songs set to a fast punk beat. This style of math rock riffing combined with the usual punkish breakdowns give the album a decent amount of flair. The vocals, however satisfying in overall tone, at equally disappointing in that they are too one-dimensional to satiate most desires for melodic singing. Yes, this is also a staple in modern pop-punk, but I find this style to be less than appealing. One thing this album does have going for it is a diverse array of tempos, beats, and guitar leads that propel listeners quickly through the thankfully short run-time. The album's 12 tracks rarely overstay their welcome, although the last two tracks average seven minutes between the two of them. This is very long for this style of music, but these tracks do offer a slightly wider palette of tastes and are somewhat more progressive than the rest of the tracks. The one thing that I don't like is the vocals. If the singer used more than one octave range and varied the delivery more often and perhaps even incorporated some screams, the disc would feel fuller and much more satisfying. All in all, "Love Always, Leviathan" is an above average album that should appeal to fans of Bowling for Soup and some of the latter works of Blink-182. Listen to the full album stream below from Icarus the Owl's bandcamp page. As always, thanks for reading and enjoy!